Conditions: Each member of group must bring their own gear, raincoat, sleeping bag, and medical insurance. Arrival in Ashgabat. Transfer to hotel. Full Day tour of Ashgabat includes: Newly built mosque Turkmenbashy Ruhy Metjidi, which is the largest in Central Asia, as well as the Mausoleum Complex of Turkmenbashy and his parents and brothers. Old Nissa - The Sanctuary of the Parthian Kings (Nissa is situated 15 km to the west of Ashgabat and was founded in the 3rd century B.C. Nissa was the capital of the Parthian Empire, which lasted for around 600 years and was the biggest competitor to the Roman Empire. Here were palace and temple buildings, repositories and the treasury of the Parthian Kings. During excavations at the site, monumental structures were exposed, including large temples and towers. Taking into consideration their great cultural meaning, the site of the ancient town has been declared a historical-cultural preserve. At present the scientific and cultural community of the republic is attempting to inscribe the old Nissa into the list of monuments protected by the UNESCO. Next we will visit the park dedicated to Turkmen horses, the pride of the Turkmen; Arch of Neutrality, Presidential Square, Gulistan Bazaar, Monument of Lenin (which was erected in 1927 and was one the few monuments which survived the earthquake of 1948), and Monument of Independence. Half Day sightseeing tour of Ashgabat. : Jygyldyk (Tolkuchka) Oriental Bazaar, which has a famous Carpet/Souvenir section, Camel section, etc. It is also one of the best places to come face-to-face with the Turkmen culture and people. After the Bazaar, transfer to the hippodrome to watch the Sunday Horse Race, a great opportunity to see Turkmen Horses in action (accompanied with a great deal of enthusiastic shouting). After tour, transfer to the Sekizyab Valley Tourist Center (STC). En route stop to visit "Saparmyrat Khadji" mosque, located 40km to the west of Ashgabat. 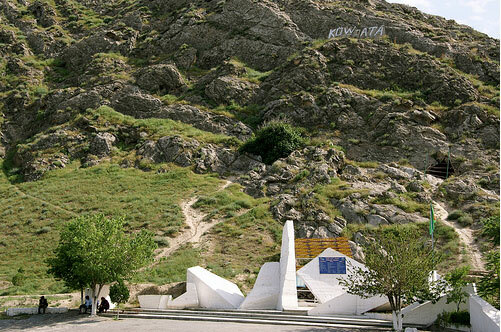 (In the Geokdepe historical and cultural center, 3 independent zones are marked: inside the fortress, a memorial zone to hold services; outside the fortress, a public zone for serving guests, pilgrims, and tourists; and the archaeological zone, a place of excavation and research. In turn, the memorial zone is divided into 2 sections. The first part is a large park, laid out in the traditions of ancient Central Asian gardens (Tchar-Bag) with canals, ceremonial grounds, an alley of heroes and a main square, in the center of which will be a monument to the defenders of the fortress. The second part of the memorial zone is an architectural ensemble, which consists of a mosque, medrassah and local historical museum with photographic exhibition, demonstrating the heroic defense of Geokdepe in January, 1881) Overnight in yurts. Full day exploring the mountains and gorges of the Sekizyab valley. Overnight in yurts. Morning transfer to Shamengli Horse Farm. En route, visit to underground lake Kow Ata which is located 95 km to the west of Ashgabat (Some information on the underground lake: Size of cave: length 250 m, depth 60 m, average width 25 m. Size of lake: length 75 m, max. width 23 m, max. depth 14 m. Volume of lake - 6,500 cubic meters) Introduction to Turkmen Akhalteke Horses and carpet factory of the farm. Excursion on horseback around the farm. Overnight in yurts. En route, stop for lunch at Kekirdek village to view the lifestyle of nomadic people. Proceed to burning gas craters. Overnight in tents near burning crater. Flight to Ashgabat, morning drive to Dashoguz. En route, stop to visit Kunya-Urgench, the capital of the Khorezm Shahs (3rd-16th cc.) Tour of old city including: Portal of Caravansaray (11th-14th cc. ), Mamun Minaret (10th-11th cc. 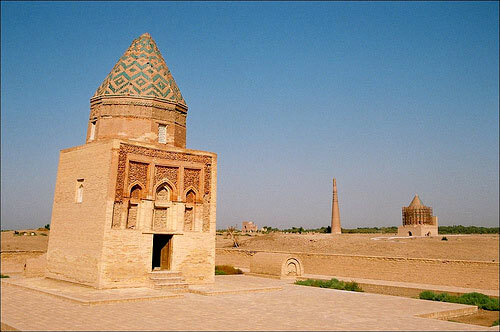 ), Il Arslan Mausoleum (12th c.), Sultan Tekesh Mausoleum (13th c.), Academy of Khorezm (3rd-13th c.), Kutlug Timur Minaret (14th c.) - one of the tallest minarets in Central Asia, Turabek Khanum Mausoleum (14th c.). After tour, proceed to Dashoguz. Arrival and flight to Ashgabat. Afternoon drive to Mary. En route, visit to Abiverd Medival City. Overnight in Mary. Morning drive to visit Margush Country (Gongur Depe - capital of Margush), Bronze Age civilization sites and the birthplace of Zoroastrianism. Picnic lunch. After tour of Margush, drive back to Mary. En route, stop for tour of Old Merv: Gyz Gala and Oglan Gala (6th-7th cc. ), Complex of Askhabs (8th-14th cc. ), Giaur Gala (4th c. BC), Buddhist Complex (4th-6th cc. 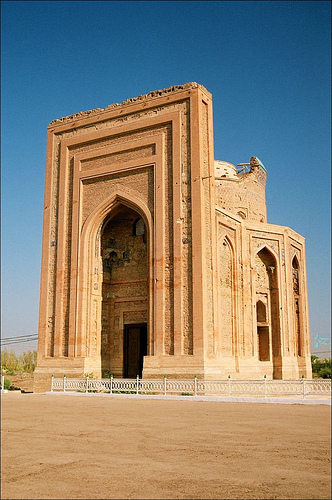 ), Beni Makhan Mosque - the first Mosque built in Central Asia (7th c.), Erk Gala (6th c. BC), Soltan Gala (11th c.), Soltan Sanjar Mausoleum (12th c.), Ibn Zeid Mausoleum (12th c.). Overnight in Mary. En route, visit to Astana Baba Mausoleum (12th c.) and Local Museum of Atamyrat. Overnight at Koytendag Tourist Base. Visits to "Kyrk Gyz" Gorge and cave (mostly visited by pilgrims), Plateau of Dinosaurs (one of Turkmenistan's more unusual sights. The inclined plateau, some 500m long and 200 m wide, contains more than 400 Dinosaur footprints. More than 2,500 in total have been discovered in the Koytendag mountains, dating from the Jurassic period); Waterfalls of "Umbar Dere" Gorge. Overnight at KTB. Visits to the "Garlyk" Caves (one of the great attractions of Koytendag; beneath the limestone hills lie one of the most extensive networks of caves in Central Asia, running in some parts to more than 50 km. 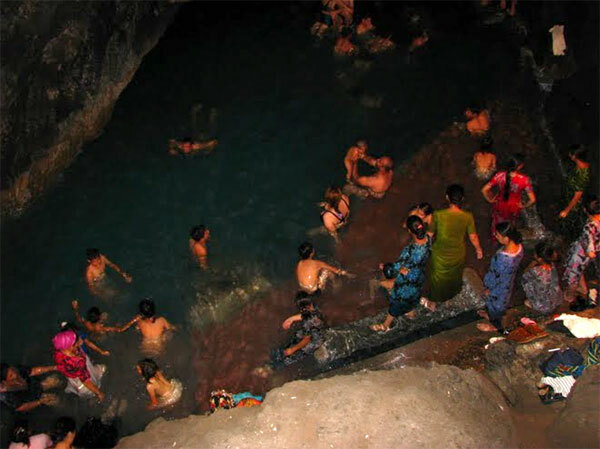 References exist in ancient Greek texts to caves in these mountains, but the complex was not properly explored until the second half of the 20th century); and "Gaynar Baba", a hydrogen sulphate spring, and a popular local bathing place. Overnight at KTB. Ascent of "Ayrybaba", the highest peak in Turkmenistan (3,137m) via Oyjamyrat and Nowparak canyons. Several rare species inhabit the area, including spiral-horned markhor goats and the urial, a mountain sheep. The hiking in Koytendag does not require any special equipment and if done at the right time of day is feasible for anybody in average physical condition. First overnight is in tents and the second night at KTB. Transfer to Turkmenabad via Hojambaz. Flight to Ashgabat. Arrival and accommodation. AM visit to the newly built tramway to the Mountain Center, located close to Ashgabat. Afternoon drive to Nohur mountain village, located deep in the Kopetdag Mountains (around 150 km and a 2.5 hour drive). En route, stop to visit Kow Ata Underground Lake. Overnight at guesthouse in village. Visit to the "Gyz Bibi" pilgrimage site, The Great Tree - the oldest tree in the village, thought to be 300-500 years old, Khur-Khuri Waterfalls, Dow Oyi Caves, Ai Dere Canyon, etc. Overnight at guesthouse. Drive to Garrygala (90 km and a 2.5 hours drive) via mountains and villages, with short hikes at Ay Dere Canyon, Syunt-Hasardag Nature Reserve, and the Sumbar Valley. Overnight in guesthouse in Garrygala. Drive to Dekhistan (Mashad-Messirian medieval town ruins which date to the 1st-17th cc.) via Balkanabat. En route, stop to visit pilgrimage site of Paraw Bibi Shrine. Overnight in tents next to the portal of the Great Mosque of the 13th c. and Minarets of the 11th c. in the "left town" which provides an unforgettable panorama of the stars with an impression of the 1,001 nights of Scheherazade. En route, stop to visit Mollagara resort and its salt lake. Arrival and short tour of Turkmenbashy. Overnight at Turkmenbashy. Last day in Turkmenistan. Morning visit to Guwlymayak (dry lake where salt has been gathered for centuries) and/or surroundings of Turkmenbashy, with its nice sandy beaches. Afternoon flight to Ashgabat. Flight # T5-244. Departure at 12:00. Arrival at 13:00. Free time or visits to the museums of Ashgabat ( National Museum of History, Museum of Turkmen Carpets or Museum of Fine Arts). Day 22: Flight to home. These programs are changeable. Upon clients' wishes, we can prolong or shorten travel days. We can also organize customized combination tours for larger groups, as well as for individual travelers on trips along the Great Silk Road (Uzbekistan, Kazakhstan, Tajikistan and Kyrgyzstan). Route covers various climate zones (deserts, lakes) so all travelers must be ready to deal with the unpredictability of the natural environment.